This article is the Copyright of the author and/or Wakefield Historical Society and is not to be copied in any medium without explicit written permission. 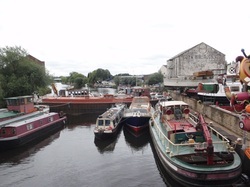 The now urbanised riverside area above Wakefield Bridge presents a number of features topographical and historical which in combination make its story a unique one in Yorkshire. Largely associated residential and industrial developments which occurred (much of it) between 1800 and 1850, with some later infilling, resulted in the growth of communities both east and (especially) west of the River Calder, each on a hitherto greenfield site, the situation in c.1794 being well illustrated by the largescale maps of the Wakefield Inclosure Award, with very few buildings indeed to the west of the river and only a few to its east. That portion of the riverside to the east lay wholly within the township of Wakefield; that to the west partly also in that of Alverthorpe with Thornes, and the ancient boundary here may well be that of the Ings Beck before the river level was raised artificially by the construction of the some 8 feet Wakefield mill dam at some date before 1140, when the area of Wakefield Ings was obviously rendered more susceptible to flooding with raising of the adjacent river’s level. The two sides of the river were joined by Wakefield Bridge, rebuilt in part in its present form from c.1342, involving a journey from the furthermost developments on each side of the river to the other of some one and a half miles, although the situation was eased by the existence of a ferry, toll-charging and capable of carrying large boat-hauling horses, from the end of Fall Ing cut. The river had been made navigable for boats in 1761 and became part of a through waterway route for goods to industrial Lancashire and Cheshire with the opening of the Rochdale Canal throughout in 1804 and then the opening of the Huddersfield (narrow) Canal in 1811; these through connections by water transport were of major significance to the development of the Wakefield waterside. The soft nature of the water of the Calder was in itself an inducement for the establishment of dyeworks and the bulk of the water earlier for the establishment of water-powered corn, malting and fulling mills, utilising its power. The increasing pollution of the river and of its tributaries from the earlier nineteenth century, combined with changes in the organisation of textile processing, rendered less economic the independent dyeing industry, while water power was less relied upon in favour of the steam engine which was not subject to the droughts, the floods, the pollution, and the legal difficulties occasioned by the use of water power. Trades which were attracted to this waterside location with good transport facilities – and these were until the 1790s directed primarily towards the east, the seaboard at Hull – were corn incoming, malt being made near the waterside at Wakefield, and coal and finished goods outgoing; all were trades already long established, but from the 1790s growing immensely and entirely reliant upon the availability of water transport; only from 1840 did modern railway transport enter the scene, but even then water transport continued to be of major significance into the years immediately following the end of the Second War. The area came to possess a number of industries which gave employment to a more than immediately local population but which were essentially reliant directly or less immediately so, upon the river: worsted spinning and other textile manufacture, including cloth, corn merchanting, malting, boat owning, operation, building and repairing, coal transhipment to river vessels, rope making (for boats), sail making, iron founding, while other goods passed through on the river or railways. The area was obviously one of an immigrant population and was almost entirely working class, although there were a very few middle class houses on the west side and three minor mansions on the easr – Belle Isle, Belle Vue and Portobello houses. For the great bulk of the population, public houses, beerhouses, shops, schools, chapel and church were established but there were no cemetery facilities or public open spaces, although each of these was available (from 1859 and 1893 respectively) at a distance of only about a mile. The area lacked, so far as can be told, any further recreational facilities other than Sunday Schools: no co-op branch, no theatre or cinema, no sports ground – only the occasional regatta on the river itself. The area was in consequence one hardly a community except perhaps in relation to residence, pubs, religious bodies, but in reality very much a new extension to the old town of Wakefield, brought about by advantage being newly taken of riverside facilities. As always, the developments occurred as a direct result of men with access to capital envisaging the returns which could be anticipated by its judicious investment in this areas potentials. Many did not have the capital required to start in a big way, and they provided part of the capital needed by earlier successful trading elsewhere, and/or by borrowing on mortgage or from the banks. The businesses varied in time and turnover from large to small – from perhaps the Holdsworths with their Belle Isle Dyeworks and the building in the early 1840s of their worsted spinning mill on the opposite bank of the river, to a small shopkeeper or a builder who ran up rows of houses to sell to investors who let them to locals. Investment – in water transport as it happens – by an insider resident, is documented, in the case of Charles Saville. It may be that the whole of the purchase monies are not included in the first of these figures, and the purchase and sales were each made at different times. The figures might suggest that they would have been better off investing their £4815. 13. 6 in a secure mortgage at say 4%. Foljambe and Maude had plans drawn for a number of new roads and streets to cross their estate from 1819, when a road was proposed roughly on the line of the (Act 1825) Denby Dale turnpike road.